MADRID (AP) — Despite another win and a perfect record to start the Spanish league, there is reason for concern ahead of Barcelona’s Champions League debut this week. The defending league champions had another lackluster performance in its 2-1 come-from-behind win at Real Sociedad on Saturday, creating a bit of worry ahead of its match against PSV Eindhoven on Tuesday. Succeeding in the Champions League is one of Barcelona’s main goals this season after struggling in the European competition in recent years, failing to make it past the quarterfinals in three straight seasons. Barcelona had a difficult time controlling the game and gave away numerous chances throughout the match at Anoeta Stadium. Luis Suarez and Ousmane Dembele scored goals three minutes apart in the second half to save the team after it conceded early. An outstanding game by goalkeeper Marc-Andre ter Stegen also helped the team secure the victory. He made two great saves in one-on-one situations while Barcelona still trailed early in the second half. It wasn’t the first time Barcelona struggled this season. 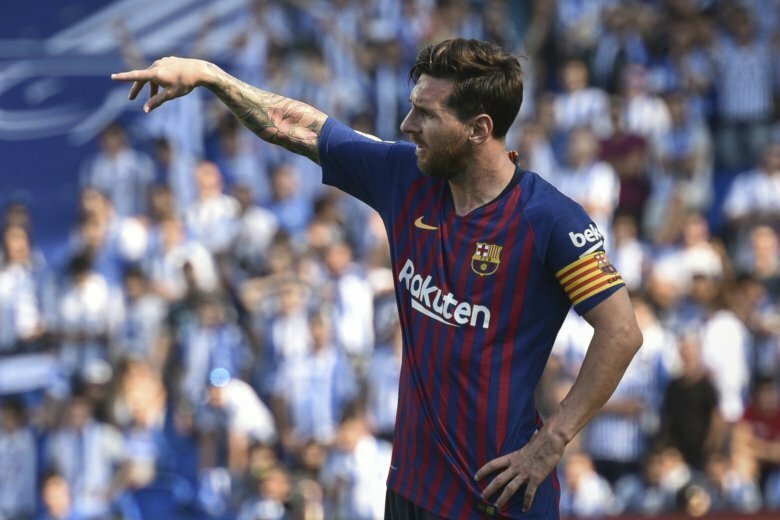 The team has been inconsistent despite its good results, and even Lionel Messi has played below expectations in some matches. Barcelona also faced difficulties in a 1-0 win at Valladolid, the small promoted club which has yet to win or score a goal in four matches. Barcelona’s home wins were more comfortable — 3-0 against Alaves and 8-2 against Huesca, a newcomer to the first division this season. Barcelona is in Group B in the Champions League, along with PSV, Inter Milan and Tottenham. Atletico Madrid endured another disappointing result on Saturday, drawing with Eibar 1-1 at home to remain far from the leaders at the top of the standings. But fans celebrated the successful debut of teenager Borja Garces, who scored the stoppage-time equalizer and could become a solution to the team’s scoring struggles early in the season. Atletico has scored only three goals in four league matches, with Diego Costa yet to find the net. Atletico, which was coming off a loss at Celta Vigo, has only five points in what has been its worst league start since 2009. Vinicius Junior continues to make his case for a chance with Real Madrid’s main squad. A day after Madrid struggled in a 1-1 draw at Athletic Bilbao in the Spanish league, the Brazilian teenager played well again with the “B” team, scoring his third goal of the season in the lower tier. He also nearly scored what would have been a beautiful goal after a remarkable run in which he cleared three defenders before having his shot hit the crossbar. It was a play that reminded some of Robinho, the former Brazil forward to whom Vinicius is often compared. Madrid spent about 45 million euros ($52 million) for the promising teenager last year even though he had played mostly with the youth squads of Brazilian club Flamengo. Madrid is taking it slowly with Vinicius, but fans have already been calling for his presence in the main team. Madrid coach Julen Lopetegui was reportedly watching Vinicius’ match on Sunday, so the player’s chances of moving up to the main team have certainly increased.